If you ever need advice on how to drag a project out as long as possible, I'm your Go-To Girl. I told LOML a year and a half ago that I would build a bookcase for her, and well...it's getting there. 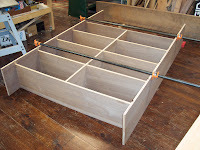 I still have to build the back, which will be ship-lapped & beaded walnut, and then build the crown molding. Good thing LOML is patient!